Atom is a modern open source text or source code editor. It is hackable to the core – means this tool can be customized to do anything. It is available for OS X, Linux, and Windows systems. 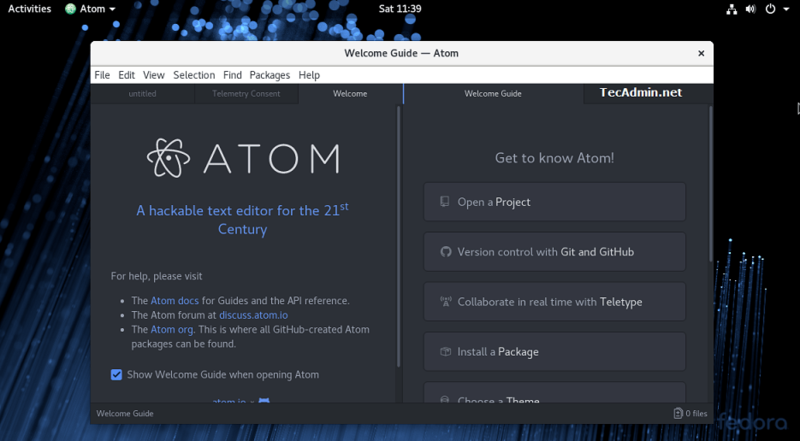 This article will help you to install Atom Text Editor on Fedora 28/27/26/25/24 systems. You may also like other powerful text editors like Sublime and Visual Studio Code for your Fedora system. Let’ download the Atom text editor RPM package file from its official website and install on your system using following commands. Press ‘y’ then enter to continue installation. As of now, Atom Text Editor has been installed on your system. Now launch the text editor using the following command or use system menu launcher.